Starting with the inimitable Jeanne Lee, pianist Ran Blake has been collaborating with adventurous vocalists for half a century. These are singers who are not satisfied by merely parroting the old repertoire in the same tried and true, but also musty and tired way. These are musicians whose vocal cords command close listening, as is the case with the Mumbai-born and New York-based Christine Correa. This Abbey Lincoln tribute, Down Here Below, is the third time Correa and Blake have recorded together over a span of 18 years. 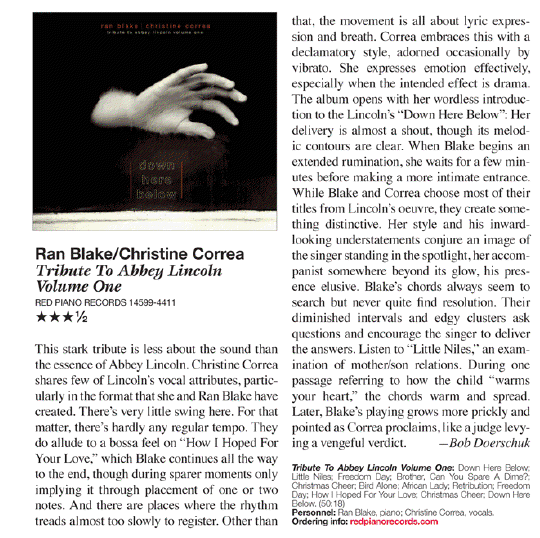 Lincoln, a musical giant, was a major influence on Lee, therefore this particular disc brings Blake full circle. With this CD, pianist Blake continues what appears to be a series of duo recordings with female singers. This time, it’s Correa, a new name to me. Together, they take on an Abbey Lincoln songbook, featuring tunes either written or interpreted by the late singer. Part of Lincoln’s power lay in the delicate, vulnerable nature of her voice. At times it was an undeniably riveting feature of her approach. 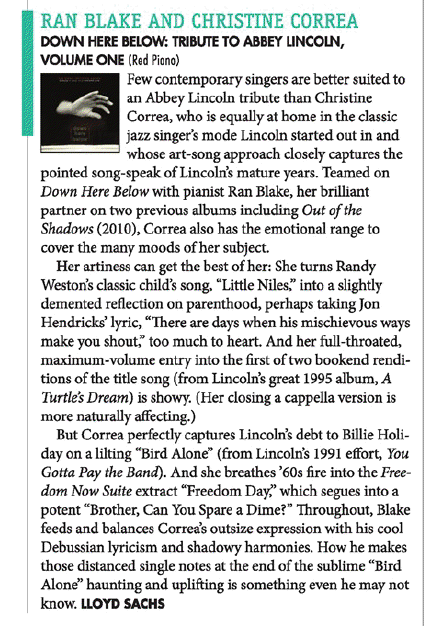 Correa, it seems, is not trying to “do” Abbey Lincoln, but there can be no doubt that Lincoln had to have been a primary influence on her conception. Blake is the perfect pianist for these interpretations; at times quirky, sultry, understated and sometimes full of mystery. You‘ll know some of the tunes (although certainly not performed like this) including “Brother Can You Spare a Dime” and two Randy Weston works, “Little Niles” and “African Lady.” A highlight that I first heard by Charlie Haden’s wife, singer Ruth Cameron, is Lincoln’s own composition, “Bird Alone.” The lyric will touch your heart. There is a recital-like quality to this release. Serious music, seriously performed. There must be a place for it. Red Piano Records, 2011, 50:18. Abby Lincoln was a rare and gifted artist. Blessed with more than a brilliant gift for song, Lincoln was blessed with ability to transcend the lyrics in a fashion where her interpretation of a song was that of the merging of the soul with the written melody. A vocalist with the sublime talent and artist passion of Lincoln passes through this life on the rarest of occasions. Lincoln passed away on 08/14/2010. Many historians reference her lyrics in direct connection to the civil rights movement and Lincoln was married to drummer Max Roach. For many, Lincoln is considered to be the next logical progression in the evolution of not only the traditional jazz vocalist but the classical American artist as she was perhaps the first true triple threat as vocalist, composer and actress with the ability to navigate between the three with a level of virtuosity yet to have been experienced on stage at that time. Down Here Below which is considered Volume 1 may best be described as the vocal portion of Lincoln’s career that include songs of protest and hope, dramatic original works and standards from the Great American Songbook. A more than fitting tribute that serves as an ominous and reflective tribute of sublime eloquence and powerful and oddly relevant works that are fitting to this day. Opening with the Lincoln original “Down Here Below” there is an artistic standard set of unparalleled dramatic quality as vocalist Christine Correa is joined by pianist/composer Ran Blake. An intimate and compelling look at an American vocalist that transcended race as well as genre in her unique artistry. Odd and shifting meter, harmonic dissonance and a quiet if not reverent melancholy haunt this release as though a guiding hand not of this earth was influencing the sonic path taken. “Brother Can You Spare A Dime” given what is now referred to as the Obama economy seem ironically appropriate in the rise and fall of not just the American but global economies across the earth. Times are indeed hard, Correa’s vocal abilities are perfect in capturing the angst and anguish of the average American family and their struggles both socially and politically. “Bird Alone” has the duo working working in close to a prayer-like lament with each musician attentive to the voice of their compatriot. Ran Blake and Christine Correa are a pristine match as an artistic duo working as one voice in their portrayal of Lincoln’s work. Having long said that the ability of a true artist is tested if not shown by taking the work of another artist and placing their own indelible mark on the work without disrespecting the original or themselves and Blake and Correa pull off this artistic gem with relative ease. A superlative release. A sublime and respectful look at an American icon. Durante los últimos meses el pianista Ran Blake ha publicado discos en dúo con varias cantantes: Sara Serpa (Camera Obscura), Dominique Eade (Whirlpool) y Christine Correa (Out of the Shadows). Si bien tanto las obras con Eade como con Correa eran más que notables, es con esta última con la que mejor sintonía se apreciaba. Por tanto, no es extraña la publicación de Down Here Below. Un disco en el que no se repasan, al estilo de lo que sucedía en las anteriores grabaciones, distintos standards junto con algunas composiciones originales. En este caso el CD, que anuncia que habrá una continuación, está dedicado por completo al universo de la enorme Abbey Lincoln. A los dos músicos les sobra imaginación para afrontar semejante reto. La muestra más palpable de ello son “Down Here Below”, “Freedom Day” y “Christmas Cheer”. Estos tres temas aparecen por duplicado. Sin embargo no lo hacen como añadidos extra o como versiones alternativas, sino como una parte sustancial del disco, ya que Ran Blake y Christine Correa realizan unas recreaciones muy diferentes entre sí. Blake vuelve a mostrar su peculiar forma de entender el universo que pueden llegar a esconder las ochenta y ocho teclas del piano. A este veterano maestro se le escucha disfrutar sobre el teclado, dejarse llevar por la resonancia de su interior, sonar intenso, disonante, y también recrearse en los espacios y en la lentitud. A lo largo de todo el disco acompaña a la voz de Christine Correa y discurre independiente de ella; deja que su compañera sea la protagonista (“African Lady” aparece interpretado a capela) y también tiene espacio para tocar en solitario. En cuanto a la cantante, sabe apropiarse del repertorio de Abbey Lincoln, haciendo de su capacidad actoral un aliado de primer nivel para aumentar la calidad de su magnífica voz. Pianisten Ran Blake og den indisk-amerikanske sangerinde Christine Correa – som har været venner gennem mere end 30 år –har med denne hyldest til Abbey Lincoln samarbejdet om deres tredje album. En udgivelse, der kommer godt et år efter Lincoln’s død, og hvis repertoire er nært knyttet til hende. For både Ran Blake, som første gang hørte Lincoln i begyndelsen af 1960erne, og Christine Correa er Abbey Lincoln, kan man forstå, en musikalsk ledestjerne. Der er taleom en kompromisløs cd, der ikke er let tilgængelig, og som givetvis vil skille vandene. Abbey Lincoln leflede ikke for nogen. Der er heller ikke tale om sædvanlige -sange, men et sangligt univers om frihed, undertrykkelse, diskrimination – og kærlighed. Nogle af dem skrevet af Lincoln selv, titelnummeret samt og. Lincolns samarbejde med Max Roach (som hun også i en periode var gift med) har sat sig spor i sangudvalget i form af hele to udgaver af Roachs. Det er ekspressive udladninger, Correa kommer med, undertiden uden Blakes forsonende akkompagnement. Som når hun ordløst intonerende indleder åbnings- og titelnummeret (som i en anden version også afslutter cd’en). Men når det så går allermest dissonans-vildt for sig, gør musikken pludselig ophold med klanglig poesi og stille skønhed. Blake mestrer underspillets og pausens kunst, mens Correa har sat sig selv på en stor opgave, som hun får i hus med sans for det dramatiske med dén virkning, at hun både er i stand til at leve sig ind i og sætte sig uden for den enkelte sangs indhold. Men om hun helt kan finde ind til den inderlighed, som Abbey Lincoln også var i besiddelse af, er et andet spørgsmål. Det er svært at lade være med at drage sammenligninger på en sådan -udgivelse – og det er vanskeligt at komme udenom Lincolns mesterskab. The common element between Sara Serpa’s Aurora and Christine Correa’s Down Here Below is obviously pianist Ran Blake. Enigmatic to a fault, Blake has made a potent name for himself among improvised music enthusiasts. Blake is an intellectual amalgam of pianists Thelonious Monk and Martial Solal distilled to a dissonant essence. Camera Obscura (Inner Circle Music, 2010) was the first recorded collaboration between vocalist Sara Serpa and her mentor, pianist Ran Blake. That recording was a moody assault on the fringes of the American Songbook, culminating in an “April In Paris” recorded at the Bates Motel after the word got out about Norman’s mother. 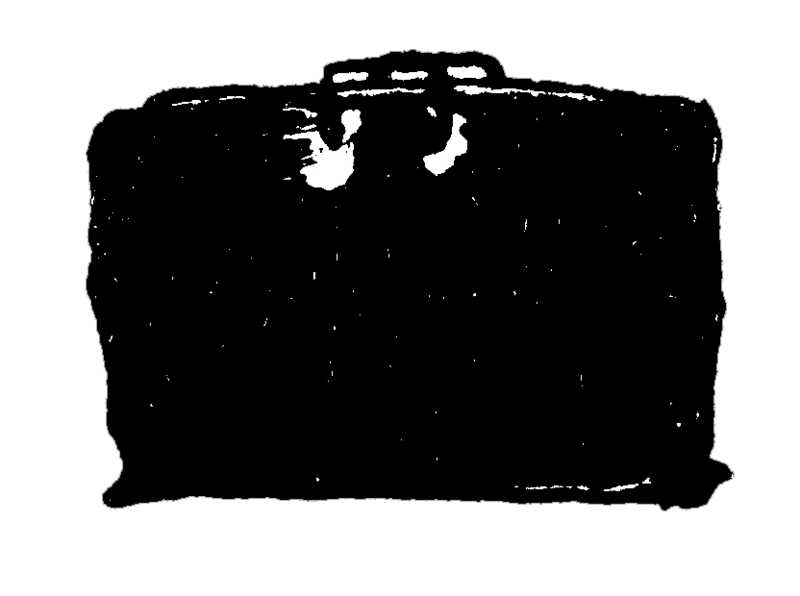 Aurora continues where Camera Obscura left off. If anything, Aurora is darker and more nuanced. A bouncy “Moonride” smolders into a stark and terrifying “Strange Fruit,” full of vocal gymnastics and vocalese. “The Band Played On” is where everything fully clicks. The late-19th Century popular tune is delivered as a crippled calliope song with Serpa taking her liberties with the material, making it suited for the remake of One Flew Over The Cuckoo’s Nest. While this sounds negative, it is anything but. A certain genius on Serpa and Blake’s part governs the interpretation of these songs, something beyond the postmodern…something well beyond. Vocalist Christine Correa has had a twenty-year musical relationship with Ran Blake that has resulted in Roundabout (Music and Arts, 1994), Out of the Shadows (Self Produced, 2010) and the present Down Here Below: Tribute to Abbey Lincoln Volume One. Neither artist show the least bit of interest in the status quo, instead opting to push the perimeter of existing repertoire well beyond the bounds of traditional performance. As with the Serpa disc, Blake remains taciturn introspective, allowing notes to collide almost randomly while Correa provides just enough aural memory that a theme to the performances indeed does exist and that theme is based on another iconoclastic artist, Abbey Lincoln. The title piece is offered in two half—a cappella renderings, delivered full-throated by Correa, dissolving into Blake’s most introspective playing on the disc. The pianist turns inward in search of the necessary pathos to spill upon the keys. The pair also doubles Oscar Brown, Jr.‘s “Freedom Day,” delivering an almost desperately anxious performance in the first take, while the second take comes off more rhythmically sound with Correa no less extroverted than the first take. “Brother, Can You Spare Me A Dime” is completely transformed from a saloon tune to a post-modern blues hymn. Where Serpa is finesse and irony, Correa is sheer power and fractured momentum. Tracks: Saturday; When Autumn Sings; Dr. Mabuse; Cansaço; Moonride; Strange Fruit; Mahler Noir; The Band Played On; Love Lament; Wende; Fine and Dandy; Last Night When We Were Young. Tracks: Down Here Below; Little Niles; Freedom Day; Brother, Can You Spare a Dime? ; Christmas Cheer; Bird Alone; African Lady; Retribution; Freedom Day; How I Hoped for Your Love; Christmas Cheer; Down Here Below. Personnel: Christine Correa: voice; Ran Blake: piano.